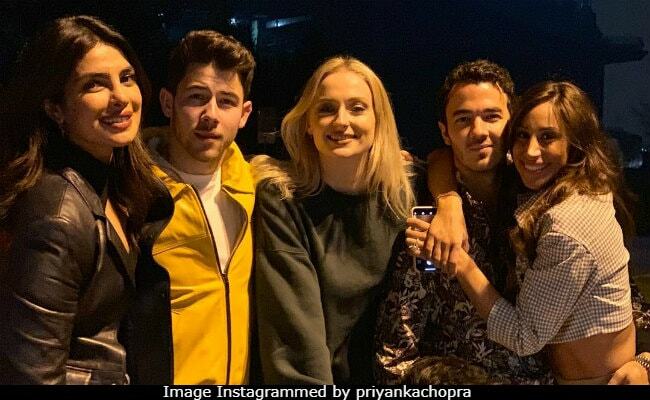 Priyanka Chopra, who recently accompanied the Jonas Brothers to Pennsylvania for a performance at a college bar, has been trending for a viral video from the party. The video, being shared by fan clubs, shows Priyanka tripping on the stairs while exiting the concert with her husband Nick Jonas. Nick, who was escorting out Priyanka, helped her balance herself while she adorably laughed it off. It was not only Priyanka Chopra who joined the Jonas Brothers for the surprise performance at the State College bar Champs Downtown but also Sophie Turner (Joe Jonas' fiancee) and Danielle Jonas (Kevin Jonas' wife) were part of the entourage. Priyanka's spunky look for the night included a black cut-out bodysuit paired with flared denims. Sophie Turner opted for a black separates with a plunging neck-lined top. Ahead of that, the Jonas sisters - Priyanka, Sophie and Danielle - were spotted grooving to the Jonas Brothers' playlist. Priyanka couldn't help but shake a leg to one or two of her favourite Bollywood dance steps - like she coordinated the Gallan Goodiyan step to the tunes of Sucker. Priyanka shared more glimpses of the fun-filled evening on Instagram with captions such as: "The Jonas Brothers are coming at you" and "The Jonas sisters are finally together." Priyanka Chopra, Sophie Turner and Danielle Jonas featured in the Jonas Brothers' comeback single Sucker. The band recently launched a brand new track titled Cool, which became an instant hit with fans. Priyanka Chopra and Nick Jonas married in December last year.